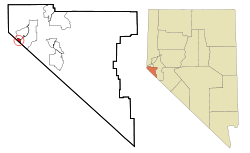 This article is about the census-designated place in Douglas County, Nevada. For the unincorporated community of Clark County, Nevada formerly known as "State Line", see Primm, Nevada. View of Stateline from near Heavenly Mountain Resort. Lake Tahoe in background. 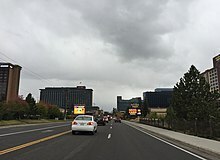 Stateline is a census-designated place (CDP) on the southeastern shore of Lake Tahoe in Douglas County, Nevada, United States. It lies next to the California state line and City of South Lake Tahoe. The population was 842 at the 2010 census. The population swells considerably during the busy winter and summer seasons, due to the high number of hotel rooms and rental accommodations available. Stateline is home to five open casinos, four of which qualify as resorts: MontBleu (formerly Caesar's), Harrah's Lake Tahoe, Hard Rock Hotel & Casino Lake Tahoe (formerly Horizon), and Harveys Lake Tahoe. The Lakeside Inn caters to locals and modest gamblers. Many of the hotels in the neighboring city of South Lake Tahoe, California, organize buses to take residents to the casinos in Stateline. 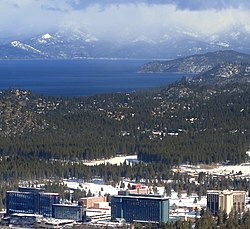 Stateline and South Lake Tahoe are effectively a single settlement, with the state line intersecting with U.S. Route 50 immediately after the Harrah's and Harvey's casinos. As commercial gambling establishments are illegal in California unless built on Indian reservations, the casinos are extremely popular with California residents due to their strategic location right on the state line. Another well-known feature of Stateline is Kingsbury Grade, which runs up and over a mountain pass, rising from Lake Tahoe and dropping down to the Carson Valley on the other side. Most of Stateline's residential and seasonal accommodation, amenities and services are located on or near Kingsbury Grade. The route can be difficult in the winter months and snow chains are essential during this time. Larger vehicles are required to allow traffic to pass when five or more vehicles are queued behind them. The Harvey's Resort Hotel bomb threat began on August 26, 1980 and continued for 2 days. The event ended when the bomb was inadvertently detonated during an attempt to disarm it. As a result, the north side of the building was destroyed. On the afternoon of January 5, 1998, the Heavenly Ski Resort was the scene of the death of musician and politician Sonny Bono. While skiing alone, Bono struck a tree on "Orion", an intermediate slope high on Heavenly's Nevada side, in Stateline. One man was killed and two Sheriff's deputies injured in a shootout inside the high limit area of Harrah's Lake Tahoe on December 3, 2005. The 2007 film Smokin' Aces was filmed at the Horizon and MontBleu Resort Casino & Spa featuring many views of the shore from Aces' suite at the casino. Stateline is located at 38°58′14″N 119°56′45″W﻿ / ﻿38.97056°N 119.94583°W﻿ / 38.97056; -119.94583 (38.970512, -119.945714). It lies on the southern shore of Lake Tahoe to the east of the California- Nevada state line from which it takes its name, and the city of South Lake Tahoe, California. According to the United States Census Bureau, the CDP has a total area of 0.8 square miles (2.1 km2), of which 0.7 square miles (1.8 km2) is land and 0.1 square miles (0.26 km2) (12.82%) is water. U.S. Route 50 traverses Stateline on its way east towards Carson City and west towards Sacramento. Nevada State Route 207 connects Stateline to the Douglas County seat, Minden. An express bus runs from the Stateline casinos to Reno-Tahoe International Airport, with adult fares at $29.75 / $53 for one-way / return journeys, available at any casino front desk. Those producing local ID qualify for a 20% discount. A shuttle also runs a circuit from the casinos up Kingsbury Grade and back for a $5 single fare. Seasonal shuttles operate to the ski resorts and casinos from South Lake Tahoe. As of the census  of 2000, there were 1,215 people, 510 households, and 245 families residing in the CDP. The population density was 1,803.3 people per square mile (700.2/km²). There were 562 housing units at an average density of 834.1 per square mile (323.9/km²). The racial makeup of the CDP was 73.66% White, 1.23% African American, 0.66% Native American, 8.15% Asian, 0.16% Pacific Islander, 13.00% from other races, and 3.13% from two or more races. Hispanic or Latino of any race were 28.97% of the population. There were 510 households out of which 25.7% had children under the age of 18 living with them, 33.7% were married couples living together, 7.3% had a female householder with no husband present, and 51.8% were non-families. 36.3% of all households were made up of individuals and 9.2% had someone living alone who was 65 years of age or older. The average household size was 2.38 and the average family size was 3.24. In the CDP, the population was spread out with 24.3% under the age of 18, 8.9% from 18 to 24, 35.6% from 25 to 44, 23.0% from 45 to 64, and 8.1% who were 65 years of age or older. The median age was 35 years. For every 100 females, there were 124.2 males. For every 100 females aged 18 and over, there were 126.0 males. The median income for a household in the CDP was $28,641, and the median income for a family was $32,167. Males had a median income of $28,309 versus $20,625 for females. The per capita income for the CDP was $16,084. About 13.4% of families and 12.7% of the population were below the poverty line, including 16.0% of those under age 18 and 8.5% of those aged 65 or over. ^ a b California v. Nevada , 44 U.S. 125 ( Supreme Court of the United States 1980). ^ a b United States Geological Survey (1891). Markleeville Sheet (JPEG) (Topographic map). 1:125,000. Reston, VA: United States Geological Survey. Retrieved July 17, 2018. ^ a b c d e f United States Geological Survey (1982). South Lake Tahoe, Calif.—Nev (JPEG) (Topographic map). 1:24,000. 7.5 Minute Series. Reston, VA: United States Geological Survey. Retrieved July 17, 2018. ^ United States Geological Survey (1963). Bijou, Calif.-Nev (JPEG) (Topographic map). 1:24,000. 7.5 Minute Series. Reston, VA: United States Geological Survey. Retrieved July 17, 2018. ^ United States Geological Survey (1971). South Lake Tahoe, Calif.—Nev (JPEG) (Topographic map). 1:24,000. 7.5 Minute Series. Reston, VA: United States Geological Survey. Retrieved July 17, 2018. ^ United States Geological Survey (1992). South Lake Tahoe, Calif.—Nev (JPEG) (Topographic map). 1:24,000. 7.5 Minute Series. Reston, VA: United States Geological Survey. Retrieved July 17, 2018. ^ United States Geological Survey (1891). Markleeville Sheet (JPEG) (Topographic map). 1:125,000. Reston, VA: United States Geological Survey. Retrieved July 17, 2018. ^ "NGS Data Sheet - INITIAL MON 1 CA NV". Survey Marks and Datasheets. NOAA: National Geodetic Survey. ^ "Granite Boundary Monument No. 1 - South Lake Tahoe, CA". Waymarking.com. Groundspeak, Inc. Retrieved 20 June 2018. ^ "NGS Data Sheet - BOUNDARY MON 2 CA NV". Survey Marks and Datasheets. NOAA: National Geodetic Survey. ^ "NGS Data Sheet - BOUNDARY MON 3 TEMP POINT". Survey Marks and Datasheets. NOAA: National Geodetic Survey. ^ "Business and Professions Code - §8771 Setting of monuments in general; monument perpetuation" (PDF). State of California. ^ "36 CFR Part 800 - PROTECTION OF HISTORIC PROPERTIES". Code of Federal Regulation. United States. ^ "Calif. Evidence Code 668". The State of California. An unlawful intent is presumed from the doing of an unlawful act. This presumption is inapplicable in a criminal action to establish the specific intent of the defendant where specific intent is an element of the crime charged. ^ "Weatherbase: Historical Weather for Stateline, Nevada". Weatherbase. 2011. Retrieved on November 24, 2011. Wikivoyage has a travel guide for Stateline.